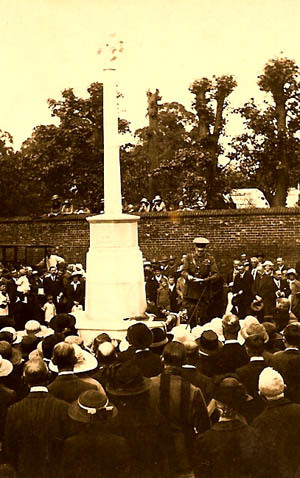 This feature tells the story of the Banstead War Memorial. It documents the decision on the location and the unveiling. It also includes photographs of all the inscribed panels and alongside each, a clear list of the names on each panel. Click on any name to take you to more detail. This section is followed by an up to date photograph of the Memorial. NOTE: This research project was started in Nov 2006 and new information is added regularly. There is still more investigation and research to be done so we still need to hear from you if you knew any of the men on the Memorial. 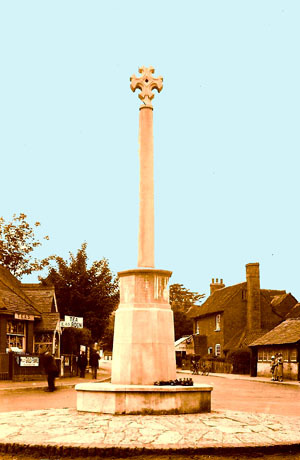 The Banstead Village War Memorial is at the eastern end of the High Street, on a small grassed area adjacent to the brick boundary wall of Well House. A few yards away is the mini roundabout at the junction of Sutton Lane, Park Road and the High Street. Right up till about 1920, this area was grassed and triangular in shape, and appears to have been a part of the manorial "wastes" - ie the Commons, and was subject to the regulation of the Conservators of the Commons under an Act of Parliament. 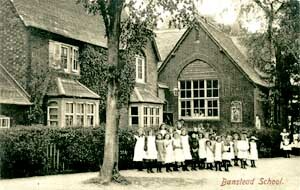 It was agreed that the Members at Banstead set up a Committee for their District. In Geoff Pushman's "Memories", he recalls how his mother, later to become Mrs Cherrie Almond, was the only woman on the War Memorial Committee, which consisted besides herself of Mr. Gale, Mr Bob Webb, Sir Henry Lambert, Sir Ralph Neville, Mr. Maynard Taylor and the Vicar. Mr Maynard Taylor advocated a horse trough but mother reminded him that in ten years from then there would be no horses on the road - something which they could not believe. Mother tried hard for a hall to be built on Horsecroft (Shallcross field), but the land was too expensive. She thought that a hall would have been the thing the men who gave their lives would have wanted themselves. However a monument was decided upon and mother therefore advocated that it should be erected at the end of Garratts Lane. She was outnumbered. "In March 1919 the Epsom Rural District Council received a letter from Mr Ralph Neville, DL, JP, OBE, of Banstead Place, stating that it was desired to erect a Celtic cross in the Village as a memorial to those who had fallen in the 1914-1918 War. It was thought that unquestionably the best site was the piece of waste land at the east of the Village and his Committee hoped that they might have the help and sympathy of the Council. The Surveyor reported that the ground was not part of the highway and was planted with laurel and fenced in and so far as the Council was concerned no objection could be raised so long as the proposed Memorial did not cause an obstruction to the highway. 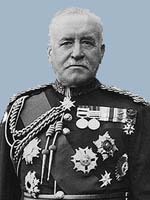 "In November 1919, the matter was again considered and the Council were advised that it would be necessary to move the guide post standing on the triangular piece of ground and the necessary consent of the Conservators and Lord of the Manor should be obtained by Mr Neville. It was resolved that Mr Neville be informed that the Council had no objection to offer to the scheme. A whole year later, on the 11th of November 1920, Mr Neville asked for permission for the War Memorial Committee to remove the fence and laurels on the Village Green when the Committee was ready to place the Memorial there. Permission was granted. The Council minutes specifically mention a Celtic cross. This usually takes the form of a normal Christian cross placed over a circle representing the sun. The Celtic reference is also often associated with the Celtic knot which is normally a never ending rope and represents eternity. The final design at the top of the memorial is not a normal cross, nor does it have a Celtic knot. The final design, shown here on the left, is close to, but not exactly the same as a cross known as St Brynach's cross. Father Brynach was a 6th century hermit in Wales and friend of St. David of Wales. He is associated with a magnificent Celtic cross outside the church in the village of Nevern in Wales. The cross dates to sometime between the 11th-13th centuries. The Banstead War Memorial Fund has now been closed. The accounts audited show receipts by subscriptions, £384 14s 11d. ; balance from Peace Celebration Fund, £7 10s 8d. ; interest on deposit account, £18 3s 3d. ; total receipts, £410 8s 10d. The total expenses, including £308 3s. for the war memorial cross, £55 5s for the erection of the base of the memorial, and £36 architect’s fees, amount to £410 8s 10d. 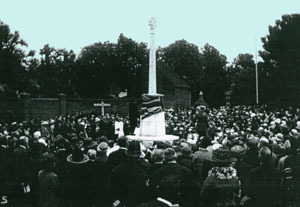 "We do solemnly desire and require that they shall carefully, piously and lovingly guard and keep it in good order from one generation to another"
The memorial was unveiled by General Sir Charles Carmichael Monro on Sunday 5th June 1921 and a leaflet for the event details the 'Procedure'. The General addressed the gathered crowd and the sixty names were read out. This was followed by The Last Post before the Memorial was 'handed over to the care of the schoolchildren for all time.' Prayers followed and afterwards a hymn was sung to the accompaniment of The Banstead Band. There followed a minute's silence and the ceremony ended with one verse of God save the King. It is probable that relatives laid flowers at the end of the ceremony. 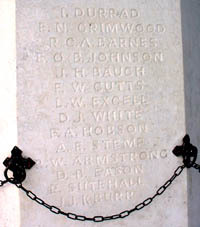 At that time, the names of the men who had fallen in the Great war were inscribed on the top panels of the Memorial. 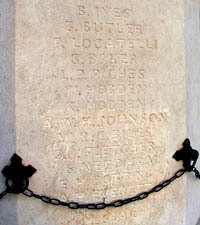 After the 1939/45 War, the names of the Villagers who fell in that War were inscribed on the lower panels of the Memorial. One puzzle now resolved relates to D R Baple whose name appears on top panel eight but who was a WW ll casualty. 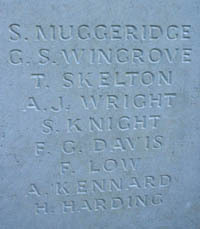 At first glance, the names inscribed on the memorial panels appear to be in no order at all, but initial analysis shows that the men on the first two panels have been listed by the date of their death, the first being Private Stephen Muggeridge of the Royal Marine Light Infantry, who died on the 26th of November 1914 aged 30. The order then changes, and although some names appear in the order stated above, others appear to be intermingled. This is an area that requires more analysis to determine any logic used to order the full list of names. Sir Ralph Neville died in 1923 and left the sum of £250 to the vicar and churchwardens upon trusts which included a condition that they keep the memorial in repair "with the names clearly legible". For nearly twenty three years after its unveiling in 1921,the Memorial stood proudly and silently at the end of the High Street experiencing no reported incidents. 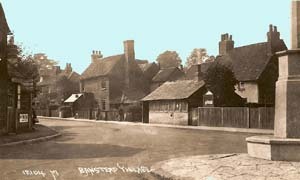 The postcard on the right shows the Memorial in the 1930s with the Village Forge in the centre of the picture. 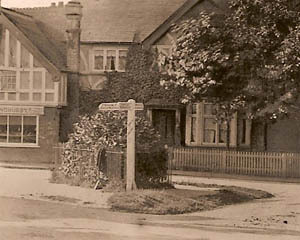 The photo below shows the Forge and Tea rooms opposite, which were a popular stopping point for travellers, visitors and locals. 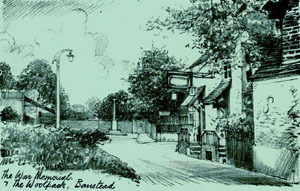 At the start of WWII, as now, Banstead had no airfield or factories and was not on any main line of communication however during the first 15 months of the War, air raid sirens sounded day after day and night after night and a large number of bombs fell in or around the Banstead area. None affected the Memorial. The period between Spring 1941 and Summer 1944 was relatively quiet with a local school only recording 6 air raid warnings during the period. On the 6th June 1944, the Allies landed in France and it seemed at that point that Banstead would have even less direct involvement in the war. This was not to be, as the 13th of June 1944 saw the first of a new kind of aerial attack on Southern Britain through the use of the new flying bombs. 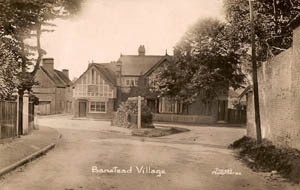 The majority were aimed at London but many fell elsewhere with several on or close to Banstead. Each carried 1400 pounds of explosive and could cause considerable damage. Up until this point, the Memorial had survived unscathed however, on the 8th August 1944, it came close to being completely obliterated when just before nine o'clock in the morning, a flying bomb demolished or severely damaged most of the buildings at the eastern end of the High street. The buildings to the west of the Memorial were reduced to rubble and a soldier, Private Donald Horsley was killed in the blast. 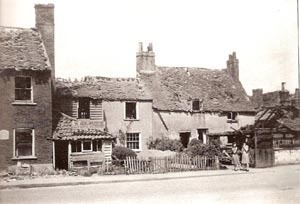 Altogether twenty eight houses and shops were severely damaged making 200 people temporarily homeless. The picture on the right shows the damage to the Forge and the surrounding buildings. Despite the devastation, the Memorial was undamaged. It can be clearly seen in the distance in this earlier sketch, as can the old Woolpack on the right hand side of the drawing. It too was damaged beyond repair by the flying bomb on the 8th August 1944. For the next fifty years or so, the Memorial remained in its original position at the eastern end of the High Street. As traffic in the Village increased, it became more and more at risk of being hit and damaged by vehicles and over the years, the possibility of moving it was discussed many times. The demolition of Well House and the redevelopment of the land behind the Memorial as blocks of flats again raised the issue. 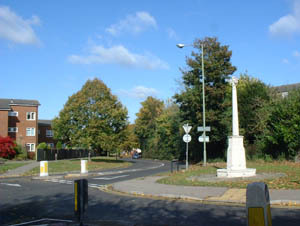 The memorial remained in its original position long after the slaughter house and dairy, shown in the background below were demolished and that end of the High Street redesigned and widened. A. E. Stemp .. unidentified.